We at archKIDecture had never heard the word before, but this structure in Colombia, South America, is called an orchidarium. It is a home for orchids. 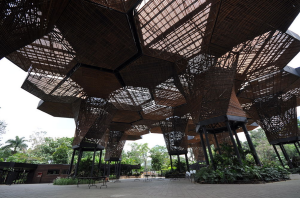 In the lush climate of Medellin, Colombia, architects from architecture firms, “Plan B” and JPRCR, won a competition to design this wooden structure for the Botanic Gardens of Medellin. The design is supposed to look like a natural shape, perhaps a honey comb, perhaps a kind of tree. It seems to grow up from the ground and flower at the top. It looks so dreamy and light, we are envious that orchids get to have such a great house. Fortunately we can all visit there, it is open to the public.